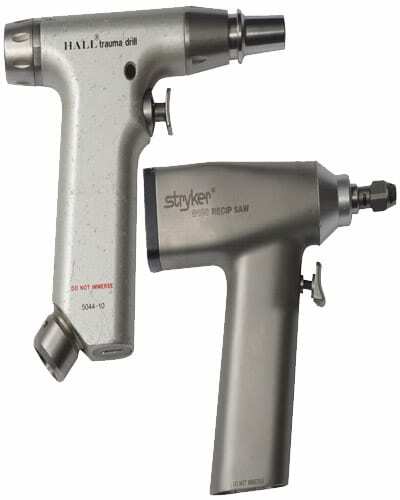 Today US Medical Systems wants to give you a closer look at a particular group of complex operating room instruments: powered surgical instruments. Due to their complicated internal design, these devices present a number of challenges for hospital personnel and service technicians. Although they might look robust and sturdy on the outside, they are very delicate and must be handled with great care. Just like with endoscopy equipment, the biggest type of damage suffered by powered surgical instruments (also referred to as PSIs) is caused by the invasion of fluids. However, while endoscopes can be processed in automatic preprocessors, PSIs must be processed manually. Powered surgical devices with internal mechanisms should never be immersed in liquids or solutions. Even something as simple as exposure to running water can cause damage to the instrument. Condensation that occurs during sterilization can also lead to corrosion. There are three main types of PSIs: electrically powered, pneumatically powered, and battery powered. Each type is susceptible to damage from improper cleaning and sterilization or a lack of preventative maintenance. However, the different types also come with their own specific problems. For varieties powered by electricity, electrical components are the most vulnerable to damage from moisture and fluids. Equipment operated with compressed gas uses gas hoses that must be carefully checked. Correct pressure settings must always be maintained during testing because excessive pressure can damage the device and even cause injury to personnel. When processing battery-powered equipment, you must pay particular attention to battery pack protection and inspection. PSIs are associated with a higher risk of injury to patients and personnel if they aren’t handled properly. It’s vital to make sure that all connections and attachments are effectively secured and all devices are tested before use. Trust the professional biomedical repair technicians at USMS to maintain your valuable powered surgical instruments.